Secret Wars revisits the Korvac Saga and Classic GOTG! This June, one of the Avengers & Guardians of the Galaxy’s classic villains returns to the forefront in KORVAC SAGA #1 – a brand-new Secret Wars series! Fan-favorite writer Dan Abnett (Guardians of the Galaxy, Guardians 3000) and newcomer Otto Schmidt take you inside the mind of one of the Avengers deadliest, and most misunderstood foes. In the Forest Hills domain, Lord Michael Korvac governs over all, ruling with an iron fist. But not all is as it seems in his corner of Battleworld. Tensions run high with neighboring lord Simon Williams and his squad of Avengers. Full-scale war is all but assured. 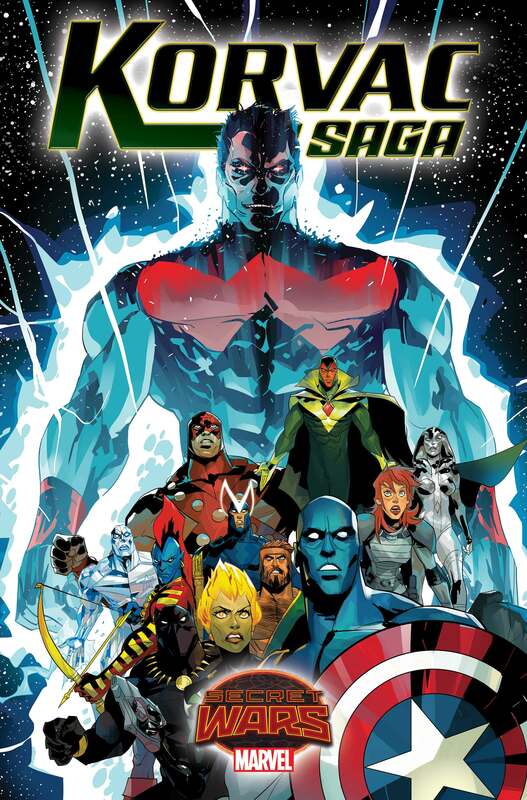 Korvac and his royal guard – the Guardians of the Galaxy – stand at the brink of destruction from within and without. Escalating border conflicts with rival lords and chaotic threats from beyond the Shield threaten all they hold dear. Worst of all, a dark madness is spreading through the population, twisting and manipulating residents of Forest Hills into monsters. Now, the classic Guardians of the Galaxy – Major Victory, Starhawk, Charlie-27, Yondu, Nikki and young Geena Drake must track down the source of this evil before it corrupts Forest Hills and all of Battleworld! Deadly threats lurk at every turn, both internal and external as their kingdom stands at the precipice. Even if they stem the coming darkness, will they be strong enough to repel Wonder Man and his Avengers? The answers lie within True Believer when KORVAC SAGA #1 explodes into comic shops in June!